The Folkestone Promenade Pier Company was incorporated on 23rd February 1875 with a capital of £10,000 with the intention of providing Folkestone with a pleasure pier. In April 1877 the capital was increased to £17,500 (1750 shares of £10 each) but due largely to opposition from the Town Council, who were worried the pier would interfere with the bathing ground, the scheme foundered. However, by 1883 the Council were signifying that they were far more susceptible to the idea of a pier and in February 1884 the Folkestone Promenade Pier Company was re-incorporated by local estate agent George Bramston Trent. The company was also keen to erect a cliff lift to connect the pier to the Leas Promenade and re-named itself the Folkestone Pier & Lift Company. The Folkestone Pier & Lift Act was passed on 7th August 1884 and a capital of £40,000 was envisaged to erect an 800ft long pier with a commodious pavilion near the shore and a water-balance cliff tramway. Unfortunately the shares were slow to sell and the South Eastern Railway baulked at its option to take part in the scheme. A further blow occurred when the option to build the cliff lift was taken up by the Folkestone Lift Company; who opened it on 16th September 1885 with immediate success. Undaunted, the Folkestone Pier & Lift Company announced a revised capital of £28,000, to be raised with 2875 £10 shares, and a new design for the pier by Noel Ridley. Manchester contractors Heenan & Froude (later involved with the construction of Blackpool Tower) were engaged to construct the pier and the foundation stone was laid by Viscountess Folkestone on Saturday, 7th May 1887. The pier was opened by Lady Folkestone just over a year later on 21st July 1888. The structure boasted a fine and commodious pavilion that could seat 800 patrons and this was leased out to theatrical companies who provided suitable high-brow entertainments for Folkestone’s largely aristocratic clientele. The pavilion held a six day publican’s licence and housed refreshment bars on the ground floor and a kitchen, dining room, bureau and balcony on the first floor. A stroll on the pier cost 2d. The FP&LC however soon found itself in financial difficulties due to the eventual high cost of the pier’s construction (£44,000) and prohibitive running costs. Another headache proved to be the floating landing stage erected off the pier head in 1889. This much-heralded structure hardly saw any steamer traffic and was taken out of service in 1892. Matters reached a head in 1889-90, but the Company was reformed and in 1894 the financial situation was eased following the granting of a £3,490 mortgage by the South Eastern Railway, repayable over a long period at 5% interest. In the same year it was decided that the pier pavilion should be leased out on a permanent basis and the large entertainment agency Keith Prowse took up the option in 1894-5. They were succeeded by King & Co from 1896-1902, who brought the great Marie Lloyd to the pier in 1898. The FP&LC even managed to make a small profit in some years, but never enough to pay a dividend to its hard-pressed shareholders, save for the 1% paid out in 1891. In 1903 the Pier Company decided to lease out the whole pier to one concern and Keith Prowse returned to take up the option at the cost of £7,000 per annum plus a percentage of the gate receipts. Herr Moritz Würm and his orchestras proved to be a great attraction and some of the big names booked to play on the pier included Dan Leno (1904), Arthur Roberts (1904), Harry Randall (1905-6) and Lillie Langtry (1906). Unfortunately the Jersey Lily’s performance in the play Between the Night and Light was roundly booed and she had to be escorted off the pier by the police followed by an irate crowd! At the end of the 1906 season Keith Prowse announced they would not be renewing their lease. Fortunately new lessees were soon found; and they proved to be a totally different kettle of fish to what had gone before. 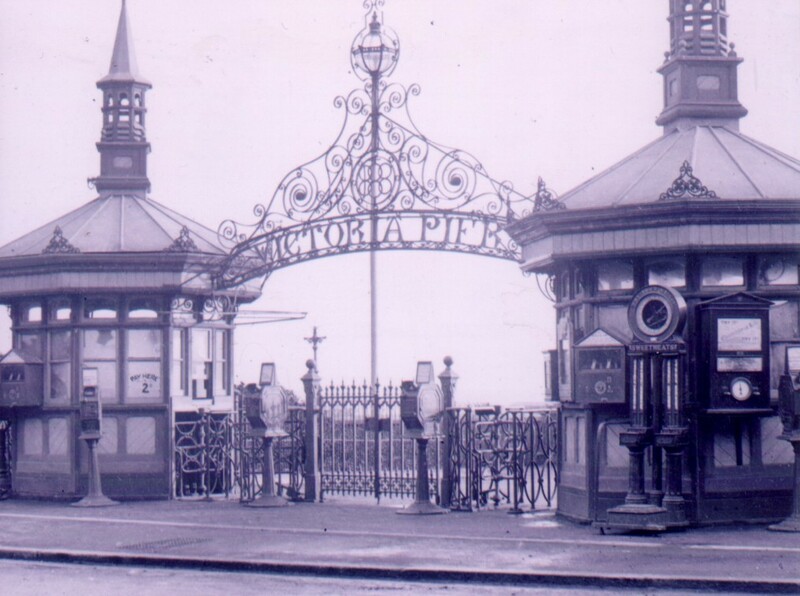 Local businessmen and councillor (William) Robert Forsyth formed the Victoria Pier Syndicate (registered on 4th April 1907 with a capital of £1,000 – 1,000 £1 shares – all taken up) and took the lease for the 1907 season. Out went the formal entertainments and in came new attractions such as novelty acts, wrestling, moving pictures and beauty contests, which were amongst the first if their kind in the world. Folkestone’s well-heeled visitors turned up their noses and shunned the pier, yet it became instantly popular with the ever-increasing number of working and middle class visitors coming to Folkestone. In 1909 Robert’s brother, Garnet, known by his middle name of Lloyd, joined the syndicate. 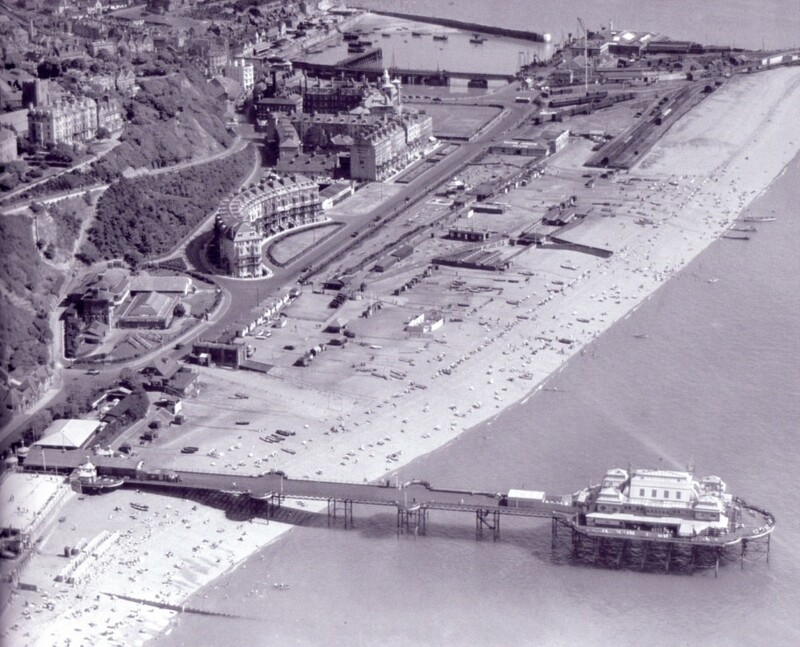 In the following year, he Forsyth’s added a further attraction to the pier, when, at the height of the roller skating craze, the Victoria Pier Olympia skating rink was opened on the western side of the pier gardens. Robert Forsyth was a forceful, but nonetheless popular, personality who frequently flouted the law as regards to showing the films on Sundays. He was continually fined for doing so, but as the profits from showing the films was higher than the fines he kept on showing them! Two further attractions added just before the outbreak of war in 1914 were an open-air dancing arena on the pier deck and a rifle range. During the First World War, the pier was popular with the many troops recuperating in Folkestone’s rest camps. A variety of comedy and propaganda films were laid on for them, as well as boxing and wrestling events. Upon the resumption of peace, the entertainments provided on the pier continued to principally consist of roller skating, novelty shows, dancing and bands. A new novelty was Captain Sidney Lawson Smith, who descended from the pier down to the seabed in full diving gear and gave a description of what he found. He also took up challenges to find items thrown into the sea. The showing of films on the pier declined in the 1920s in face of competition from the established cinemas; however an increase of interest in jazz led to more bands being hired. The roller skating rink was home to the Folkestone Hockey Club and all host of skating games and activities, while amusement machines were introduced by Fred Harrison in a small arcade at the shore end of the pier. The novelty shows continued to draw in good crowds with such features as the jolliest face competition, balloon carnivals, the gentleman with the jolliest laugh, the best head of hair for men, the curliest head of hair, the ladies with the sweetest smile, the prettiest children, the most sparkling eyes and even a complexion show that claimed to be the first of its kind in England – all before Butlins! The racy ankle shows in particular were very well attended; each contestant having to walk along a bridge running into the centre of the pavilion, which was screened so only the legs up to the knee were visible. The pier was also always a very popular vantage point on the annual regatta days and laid on a big carnival with fireworks to round off the day. Since 1919 the Victoria Pier Syndicate had been very much a family concern, and following the resignation of Lloyd in March 1930, the four members consisted of Robert, his wife Edith and sons Hugh and Joseph. Sadly, in 1934, Robert Forsyth passed away and his Victoria Pier Syndicate was wound up by Edith between May and October 1935. By this time this time the condition of the pier was causing concern and an inspection revealed that much of the ironwork was corroded and the wooden decking rotten. Nevertheless, Lloyd Forsyth and his Southern Trading Corporation leased the pier until 1937 when the Ramsgate amusement entrepreneur Dennis Franklin Warren took over. He unveiled ambitious plans to totally rebuild the pier entrance with an art deco-styled concrete building containing an entertainment hall, sun lounge, restaurant and bars. However the plan never came to fruition, nor did Warren’s proposal to purchase the pier from the Folkestone Pier & Lift Company; now consisting of a few elderly directors who lacked the drive and enthusiasm to make the pier pay. The pier was closed at the outbreak of World War II, although it was subsequently reopened for a short period. However visitor numbers were meagre in the extreme; with only seven customers paying to use the pier on Tuesday, 16th April 1940! Two months later, on 11th June, the pier was closed again to allow the centre section of the structure to be blown up as a defence measure. The gap was closed with a small bridge in 1943 when a pump was housed in the pavilion to enable seawater to be used in the fighting of fires caused by enemy action. Not surprisingly the pier became very run-down as the war dragged on and as military restrictions began to be lifted dare-devil locals and military personnel clambered along it, in spite of the lack of wooden decking. Sadly, one of the intruders deliberately set fire to the pier pavilion on Whit Sunday, 20th May 1945 and completely destroyed the sea end of the structure. The fire dashed all hopes that the pier could be repaired and it forlornly lay derelict as arguments raged on who should pay for its demolition. The Folkestone Pier & Lift Company had virtually ceased to exist, but nevertheless were summoned on 21st June 1949 for failing to exhibit warning lights on the derelict structure. In the end it was left to the local landowner the Earl of Radnor and his estate to commence demolition of the pier in 1952. The last section of the old pier was finally blown up in November 1954. The pier’s publicans licence, suspended since 1943, was removed to the Beach Hotel, 4-5 Marine Crescent on 25th May 1955. Today, only the abutment to the pier and a small section of iron supporting column survive to show where it once stood.